"MOGADISHU (Reuters) - Ethiopian troops supporting Somalia’s government withdrew completely from Mogadishu on Thursday, witnesses said, leaving a power vacuum in the capital that is expected to lead to more bloodshed. But others believe it could be a positive development for the Horn of Africa nation — which the United States has long feared could become a haven for militants — spurring moderate Islamists to join a new, more inclusive administration. After the resignation of former president Abdullahi Yusuf, a new Somali president is supposed to be elected by January 26. Former prime minister Nur Hassan Hussein told a news conference in Mogadishu on Thursday that he would stand for the post. 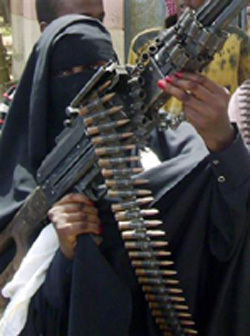 Al Shabaab, which Washington has formally listed as a terrorist organization with close ties to al Qaeda, has vowed to attack African Union (AU) peacekeepers and government facilities such as the capital’s main airport after the Ethiopians leave. Ethiopia, frustrated by rifts in the Somali administration, the cost of its operation and the lack of international support, began dismantling its main bases in the capital on Tuesday." 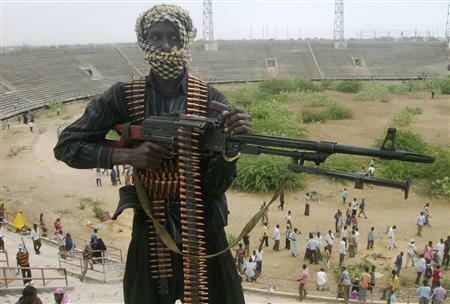 An Islamist insurgent holds his machine gun inside the stadium, one of the bases vacated by Ethiopian troops in the capital Mogadishu January 14, 2009. 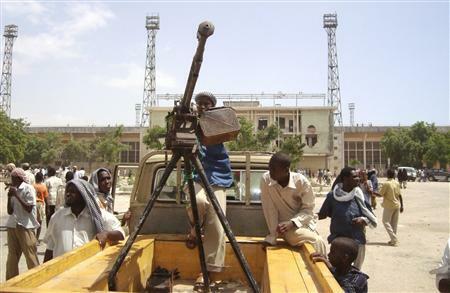 Islamist insurgents gather outside the stadium, one of the bases vacated by Ethiopian troops, in the capital Mogadishu January 14, 2009.